Tonight I wanted to share something we stumbled upon during our trip to Florida. When we arrived in Ft. Lauderdale Florida we drove to the beach to get a bite to eat before heading on our way and found this fabulous statue. 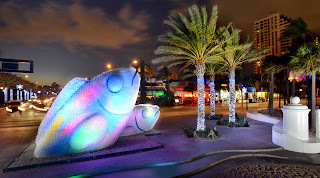 This is the Ft. Lauderdale fish statue that is located along the beach. The fish were sculpted and then fitted with thousands of recycled water bottles from the area. These fish have a wonderful texture and design during the day and when illuminated during the evening, they almost come alive.